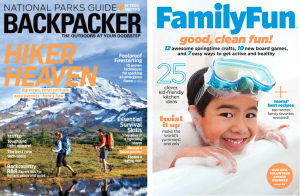 There are some sweet deals for Backpacker or FamilyFun magazine subscriptions today! Grab a Backpacker subscription for $4.50 when you enter the code: SOUTHERNSAVE at checkout. Backpacker is the perfect fit if you’re looking for fun ways to get your family outdoors for a summer adventure. It’s articles give advice to make any trip better! Or, order a FamilyFun subscription for $3.99. FamilyFun is full of activity ideas including cooking, crafts, travel, volunteering and more. The ideas are centered around making the most of family time! Use the same code: SOUTHERNSAVE for this awesome discount! Both of these deals last until midnight tonight!